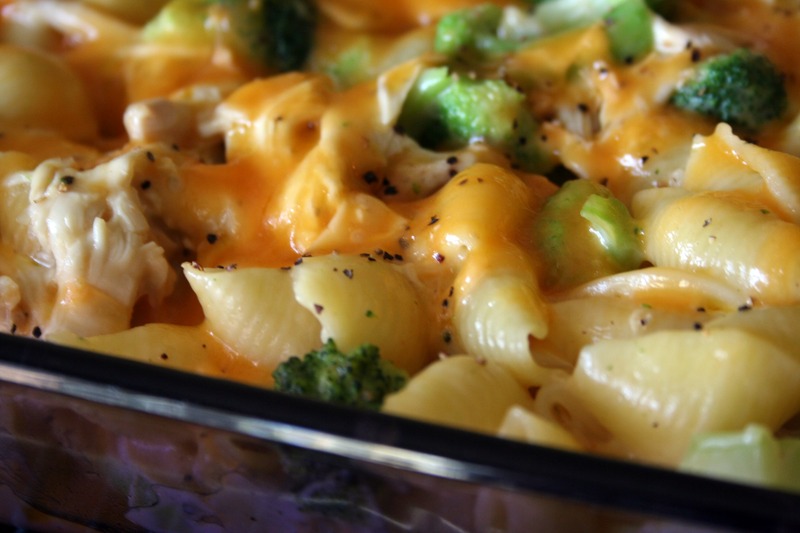 Alfredo, Shells, Chicken, Broccoli and Cheese! This is a recipe my sister gave me years ago – I don’t know what its official name is, so that explains why this title is so long! ;o) It also leaves no questions as to what is in it. My family has always enjoyed this and it couldn’t be easier to throw together. Thanks for reading! 1. Preheat oven to 350 degrees. Rinse and pat dry the chicken breasts then season them well with olive oil, salt and pepper. Roast in the oven for 30 – 35 minutes. Let the chicken cool until you can safely handle it, then shred it and set it aside. 2. Put a large pot of salted water (at least a gallon) to boil. Once it’s come to a rolling boil pour the pasta into the pot, stir occasionally to prevent sticking and to ensure even cooking. Once it’s finished, drain pasta and set aside. 3. Steam the broccoli in the microwave by dumping the bag in a microwave safe container. Add a little water then cover tightly with plastic wrap – don’t forget to poke a few holes to let steam out. I cooked mine for 4 minutes – they don’t have to be completely cooked through. 4. Get a large bowl out add pasta, shredded chicken, cheese, broccoli and alfredo sauce, then season well with lemon pepper. Spray a 13×9 baking dish with Pam and pour the pasta mixture then sprinkle the top with more cheese. Cover loosely with foil and bake for 25 minutes, then remove foil and bake for another 5 minutes, or if you like your cheese to brown and bubbly, you can place it under the broiler for a few minutes instead. Enjoy! this recipe looks super yummy! I would like to make it for my family. I was just wondering how much pasta you use? Hi, Erin! The whole box – one pound of shells or your preferred pasta shape. Thanks for stopping by! Hi. Sounds really good. What Alfredo sauce do you use? I used Bertolli Alfredo sauce 🙂 Thanks for stopping by! Depends on how much you serve, but easily 8 to 10 people. Thanks for stopping by! It made a lot of food!!!! It does make a ton of food, and it’s easy to tweak here and there to your liking 🙂 I’m glad you tried it! I just made this. It was easy and pretty good. I enjoyed it but I dont think I’d make it again. would you be able to prepare this meal ahead of time and freeze? That’s a great question – but I’m not sure that it this would be ideal to feeze. My concern is that the cheese and alfredo sauce may not freeze then reheat well once they’ve been mixed up with all the other ingredients. I did a quick search learned that alfredo sauce and cheese can be frozen on their own, but the texture can be effected once thawed. I know this is a long-winded explanation, but I hope it helps 🙂 Thanks for stopping by! it might be better reheated by stovetop so the icy consistency is cooked out!? omg I just made this,, the only thing different I made was the chicken,, I just sautéed it with rosemary, olive oil and garlic,,, it was soooo yummy!!!!! it had an olive garden taste!! THANKS SO MUCH!!!! Awesome! I’m really glad you made it your own 🙂 Thanks for stopping by! Thinking about making this in the crock pot… What do you think? Anything I would to tweak? I just cooked this for me and my date this evening-success! Delicious…I would just add a little bit more salt and pepper since I opted to not add the lemon pepper flavor. Can you use boneless skinless breasts instead? This was ABSOLUTELY DELICIOUS. It fed 4 adults and 3 kids and we still have leftovers. I will make this again and again!! Thanks for sharing. YUM!!!!! So excited to cook this.tonight!! This was honestly kind of bland and dry. I wouldn’t use the whole package of noodles. Maybe 3/4 of the package. Delicious! We added mushrooms and rosemary and it really rounded out the dish. Have you ever made this the day before? If so, do you change any thing up? Didnt have alfredo sauce so I added cream cheese and some sour cream, delish! making this tonight for my fiance! so pumped! I’ve made this dish 3 times in the last 3 months! 🙂 I added something different each time but the basics are all the same. I love it!! Thanks! Love the website as well. I’m so glad you tried it out and made it your own 🙂 Thanks for stopping by! I make this about once a month, my family loves it. I use a little more alfredo sauce and add mushrooms and bacon and season with garlic powder. Sounds delish! 🙂 Thanks for stopping by! Can I assemble this ahead of time and then just keep it in the fridge until I am ready to bake it? Yes, you could make this ahead and heat it in the oven when you’re ready to bake it. It may take a little longer to heat through, though. Thanks for stopping by!